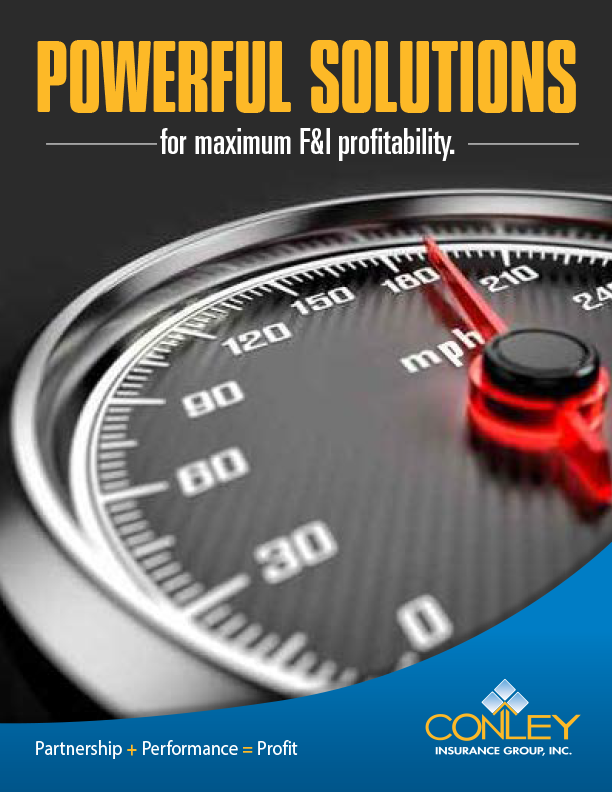 Download our full catalog of highly profitable products and solutions. Get updates from Conley Insurance Group about industry news, our team, our products, and more! CNA National has been committed to providing automobile dealers and their customers with the finest programs and the highest level of service for more than 35 years. While they have grown into one of the most recognized providers in the industry, they haven’t lost touch with the personalized care that remains a hallmark of their success. Products include: extended service contracts, lifetime warranties, tire coverage, and more! Among the elite of Conley’s preferred providers is Premier Dealer Services (PDS). PDS’s programs drive loyalty and keep customers coming back to your dealership again and again. While many companies claim to be bottom line oriented, PDS backs their claim with advanced software and support to help you expedite sales and submissions accurately and efficiently. Recognized for providing high-demand products that enhance productivity and increase profitability, National Automotive Experts continually provide the automotive community with innovative, ground breaking solutions. National Automotive Experts’ reputation for nimble, state-of-the-art, customizable administrative services makes them a favorite of dealers from coast-to-coast. By working the way you do, rather than expecting you to conform to their systems, National Automotive Experts products and programs can be incorporated into your existing structure with speed to market and minimal training time. Plus, with service contracts that extend to RV’s, powersports, and even high mileage vehicles, National Automotive Experts provides a one-stop for value-driven products designed to enhance customer loyalty, drive service retention and boost bottom line numbers. Wise F&I delivers value for the dollar thanks to a menu of services you shouldn’t be without, making the company a Conley favorite. When considering Wise F&I, be sure to consider their lightning-fast service and comprehensive commitment to both consumers and dealerships. You won’t find a more thorough provider anywhere, making Wise F&I one of the wisest choices on the market. Let Conley show you how Dent Wizard’s Ding Shield Program can create a substantial revenue stream for your dealership. By leveraging the biggest name in dent removal with a 36-, 48-, or 60-month new and used vehicle protection programs, you’ll have what customers need to keep their cars looking showroom new. And with over a thousand certified technicians in the US and Canada, your customers will always be near a repair center. By providing customers with nitrogen instead of compressed air, you can improve their driving experience and save them money. turnkey program that delivers profits. When it comes to credit life and disability insurance, Conley keeps you covered with two respected providers, Central States of Omaha and Guarantee Trust Life. Our credit insurance products are designed to protect vehicle loans, providing families with benefits in the event of a catastrophic event such as death and disability. Client Command delivers direct marketing programs guaranteed to work, or your money back. The pay for performance model makes this program highly popular. One of Inc. Magazine’s “fastest growing companies in America,” Client Command’s sales guarantee is a game changer in the automotive world. Over 1,500 dealers now use Client Command’s programs. If you’re not using Client Command’s measurable marketing, you’re losing business to your competitors. The ResistAll family of products are the most advanced, powerful exterior and interior environmental protection products available, with one of the most comprehensive warranties in the industry. ResistAll has interior and exterior protection that the manufacturer’s warranty does not cover. Their products are water-based, meeting strict environmental standards, so not only to further protect your vehicle from the environment on the outside, but also you and your family on the inside. And ResistAll can be purchased on both new and used vehicles. VisionMenu is web-based and easy to use. With a fully customizable and simple-to-use menu, you can present, sell, and e-contract F & I products in a profit-focused, efficient way. Keeping the customer’s experience in mind, their software has a variety of menu types that make the buying process more efficient for the customer. the ZERO Plan which is a premium installment payment plan used by Retailers to sell extended service contracts and other ancillary protection products. Industries served include Automotive, Power Sports, and RV. Retailers offer 0% payment terms to customers to help market their products by making them more affordable and then transfer the payment contract to Universal Lenders LLC to service the installment plan. To learn more about Partners Overview, please contact Steve Phillips.